If you haven’t heard by now, only the latest versions of Internet Explorer are supported on all Windows operating systems as of January 12th, 2016. For most IT Pros, this means upgrading from IE8, IE9, or IE10 to IE11 on Windows 7. There are lot’s of ways to accomplish this; a patch, a package, an application, a task sequence, using the IEAK, or using the PowerShell ADT. Each of the different methods have their pros and cons, and when I went to evaluate the method I wanted to use, I found none of them had a very good user experience. To work around a lot of these issues, I tested some of the methods above and decided on using a task sequence with a few tricks to get the best user experience possible. I wanted to ensure my users were not impacted when we upgraded them. Originally I was using the task sequence with the standalone .exe, but could not get past the issue of IE being force closed. I even wrapped it in the PowerShell ADT and found a limitation that it would not run interactively even after specifying the -DeployMode Interactive parameter. I even tried ServiceUI and still had no luck. I wanted to emulate the experience that deploying as a software update would provide, so I resorted to DISM and using the extracted CAB file. ***WARNING*** The method below assumes you have all 9 pre-req patches already deployed, so the TS does not account for any pre-reqs. If you do not have the pre-reqs already installed, you can add them easily using Venu’s Singireddy’s method. This will require two reboots in your install though. They would get IE11 and the Ent. Mode patch, but because they were offline after the reboot, they could not download the Ent. Mode Site list, which contained compat settings needed to reconnect to the VPN! If you need to add a domain to Compatibility View without utilizing your Ent. Mode Site List, you can modify the below script and add it to your task sequence. Our deployment was non-interactive, so the files downloaded before executing the TS, IE11 installed, and the user is none the wiser until they get the below prompt! This solution solved all our needs, IE is not force closed, user only has to reboot once, Ent. Mode is enabled immediately, and user downtime is basically just the time it takes to reboot. Great blog. I am not able to get SMStimereboot to work ? Can you pls provide screenshots with the conditions set ? For the reboot, make sure you use the proper task sequence variable: SMSRebootTimeout. Btw i am also using Task sequence to install IE 11. Can the update KB3134814 be installed after the install of IE 11 and then the machine rebooted? At the moment i have pre reqs installed first ,followed by IE 11 and then a single reboot. You can inject IE11 pre-req’s using DISM and do not need two reboots in this case. I guess it would make your Task Sequence even nicer. Really? That is not what we saw in testing. You can inject the pre-reqs, install IE11, and install the post-install CU, without a reboot? How are you installing IE11 and the post-install CU? I am using WUSA and DISM to inject pre-req and in this case I do not need to reboot the machine before IE11 installation (via DISM). As soon as IE11 is installed I am rebooting (same way as you). I did not try to install the post-installation update on top though. That’s great! I will try that out. I have followed your guide exactly; used a TS just like you advise as i wish SCCM TS engine to control reboots, but after the IE11 install ( dism /online /add-package /packagepath:IE-Win7.CAB /quiet /norestart ), my deployment ALWAYS reboots and the timer is 30 secs. the /norestart switch is not obeyed. Hmm, check the dism.log on the machine to confirm it’s causing the restart. Sometimes it may kick it off if there is already a pending reboot. Hello, I’m trying to configure automatic restart of machine after the patch deployment. How to do that in SCCM. Is there any option I’m missing? Thanks in advance for your assistance on this. 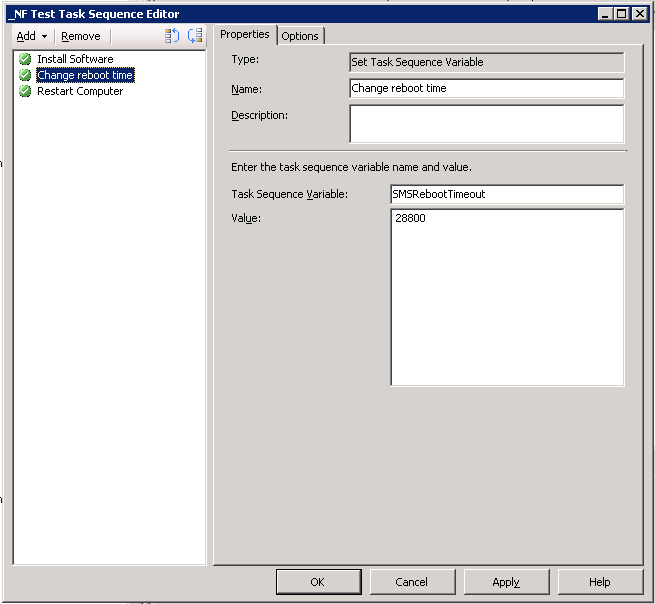 Hi Ankit, if you are using a task sequence you just add a restart computer step. If you are deploying via software updates the client settings control the restart timers and such.